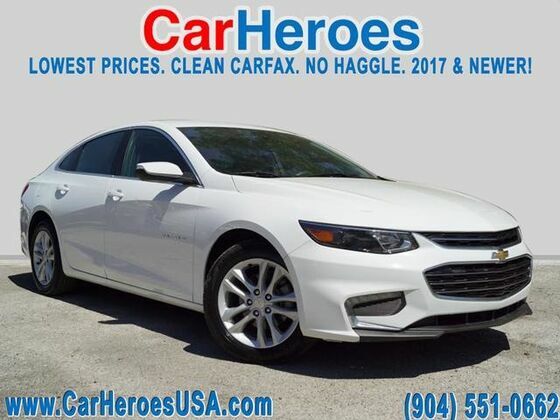 This outstanding example of a 2018 Chevrolet Malibu LT is offered by CarHeroes. This Chevrolet includes: SUMMIT WHITE JET BLACK, PREMIUM CLOTH SEAT TRIM Cloth Seats AUDIO SYSTEM, CHEVROLET MYLINK RADIO WITH 8" DIAGONAL COLOR TOUCH-SCREEN, AM/FM STEREO Smart Device Integration AM/FM Stereo Bluetooth Connection Auxiliary Audio Input MP3 Player ENGINE, 1.5L TURBO DOHC 4-CYLINDER DI 4 Cylinder Engine Gasoline Fuel Turbocharged *Note - For third party subscriptions or services, please contact the dealer for more information. * Your buying risks are reduced thanks to a CARFAX BuyBack Guarantee. The Chevrolet Malibu LT is economically and environmentally smart. Chevrolet clearly delivers on its promise to provide a fuel-efficient vehicle that has the great qualities you need in a vehicle. The 2018 Chevrolet exterior is finished in a breathtaking Summit White, while being complemented by such a gorgeous Jet Black interior. This color combination is stunning and absolutely beautiful!